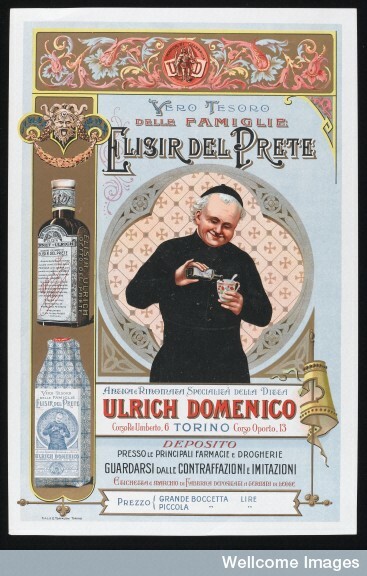 An advertisement for the tonic Elisir del Prete, c. 1910 (Wellcome Images).  Medical traditions: the non-natural environment and the Passions of the Soul.  Religious traditions (for example, the Church Fathers, sermons and devotional literature).  Medical knowledge and practice of religious personnel, including secular and regular clergy.  Medical practitioners, religious authorities and the regulation of medical activity and practice.  Religious responses to epidemics, from leprosy to plague to pox and cholera.  Medical missions in Europe and the wider world.  Religion, humanitarianism and medical care.  Religious healing/ miracles/ pilgrimage.  Institutional medical care (including hospitals, dispensaries and convalescent homes). Proposals, consisting of a paper abstract (no more than 300 words) and a short biography (no more than 400 words), should be submitted to [email protected]gmail.com by 30 October 2015. We will to respond to proposals by early December. For more information please visit our website, at https://religionandmedicine.wordpress.com/, and follow us on Twitter @RelMedConf2016.